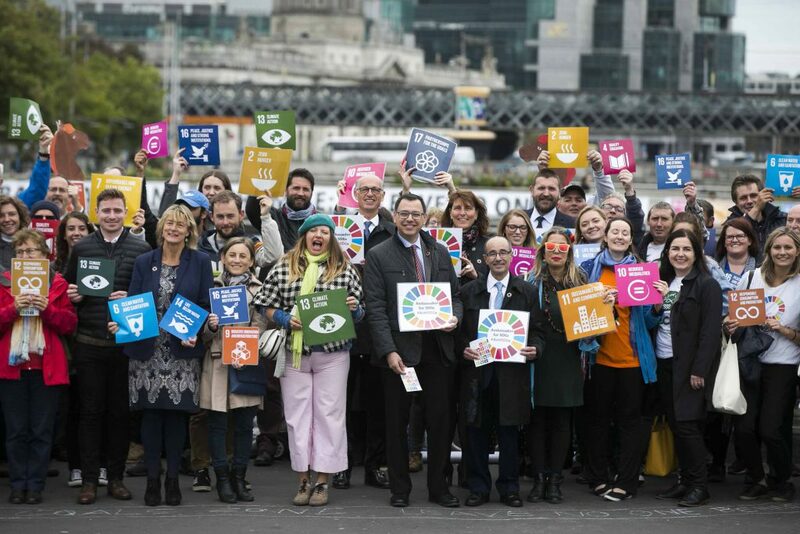 Ambassadors, civil society and citizens have gathered in Dublin to mark the 3rd anniversary of the historic adoption of the United Nations ‘Sustainable Development Goals’ – a roadmap toward a more just and inclusive world. Members of Coalition 2030 join the Ambassadors of Belgium, Malta and Spain, alongside representatives from the Department of Communications, Climate Action and Environment and members of the Irish public to commemorate the third anniversary of the signing of the Sustainable Development Goals. Exactly three years ago an historic event took place. After perhaps one of the greatest feats of diplomacy – the product of highly complex negotiations, co-chaired by the Irish government, the global community endorsed seventeen Sustainable Development Goals (SDGs). The goals are an expression of what the global community agrees are the priority areas in helping to shape a world that addresses inequality and injustice. ChildFund Ireland is a proud member of Coalition 2030, the collective voice of over 100 civil organisations working towards implementation of the goals. Coalition 2030, an alliance of over 100 Irish civil society organisations and networks, today led a street march in Dublin city centre as part of the Global Day of Action to reinforce commitments towards the Sustainable Development Goals. They were joined by members of the Irish public, alongside ambassadors from Belgium, Malta and Spain, and Government representatives. They drew the public’s attention to a massive banner hung on Rosie Hackett Bridge which read ‘17 Global Goals and A Promise: Leave No One Behind’. The group then walked to the Garden of Remembrance on Parnell Square where two living in Direct Provision in Ireland led a spoken word performance. Speaking at the event, the Ambassador of Belgium and Coalition 2030 members highlighted the importance of the 2030 Agenda and the importance of Leaving No One Behind. The Leave No One Behind promise aims to ensure that the 17 goals can only be considered met if they are achieved for all nations, peoples and segments of society, and that the poorest, most deprived and marginalised are reached first. Other major events took place across 123 countries today to press for the practical application of the SDGs. For example, the Tánaiste Simon Coveney joined the annual global Central Park concert in New York to mark the anniversary and will also speak at the 2018 Global Citizen Festival on Saturday. “With 800,000 people in poverty, 700,000 on healthcare waiting lists and 10,000 people homeless, Ireland is a profoundly unequal place. Policymakers must acknowledge that a thriving economy is not a goal in itself, but a means to social development and well-being for all”. A concerted all-of-government and all-of-society approach is essential to achieve the SDGs and reduce inequality”. “Ensuring meaningful participation across Irish society is crucial to combat exclusion and achieve the Sustainable Development Goals for all people, everywhere. For this to happen, marginalised groups need to have their voices represented and space for collaboration in plans, policies and commitments towards the SDGs, with a continued strengthening of National Stakeholder Forum”.